Man oh man it’s hot out! Took the dog out for a run and he almost overheated. And it’s only April? What is going on? Since it seems we skipped spring and moved straight into summer, I will now officially declare this summer the summer of ice cream! Homemade ice cream to be exact. So many different flavor combinations possible! ChezSylvia is going to have a lot of ice cream around! So, I went out and bought the ice cream maker attachment for my trusty kitchen aid mixer. 20% coupon in hand, off to Bed Bath & Beyond I went. Ice cream maker acquired, first order of business was to freeze the bowl. I kept the bowl in the freezer for a whole week to ensure maximum frozen-ess. 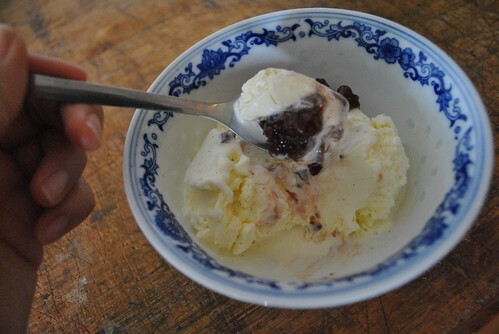 The ice cream maker basically just mixes the ice cream around in very cold bowl to freeze the custard while incorporating air into it too. Very simple concept, and with this get up, no rock salt needed! 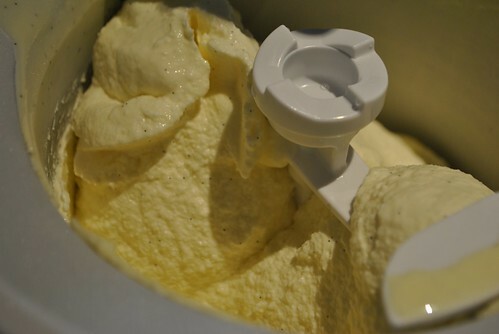 Making ice cream is a two day process. First you have to make the custard and let it chill. Then you put it through the ice cream maker and back in the freezer to set. Easy pezy, but just a lot of waiting time. For my first batch, I figured I start out with just plain jane vanilla. After comparing and contrasting all kinds of recipes for ice cream, I finally settled on the one out of the America’s Test Kitchen Family Cookbook version. 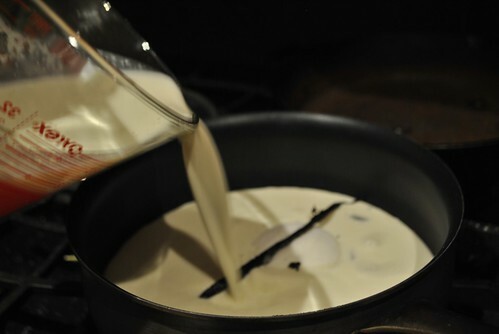 Heat up the milk, cream, vanilla pod and seeds and 0.5 cups of the sugar in a medium saucepan. Stir occasionally and heat until hot and steam just starts appearing (175 degF…I just used my thermometer and probe set I usually use when I roast up meat). Once the milk mix is hot, whisk the remaining 0.25 cups of sugar and egg yolks together (I shut off the flame for this part). 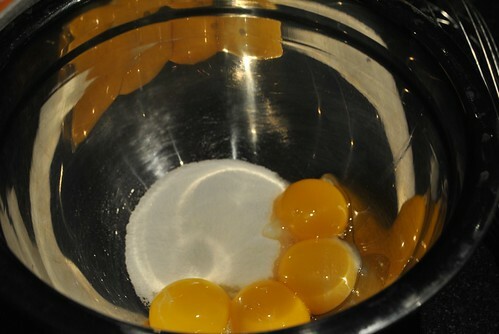 Temper the egg yolks (to prevent curdling) by slowly adding in a cup of the hot milk mix into the egg mix while whisking. 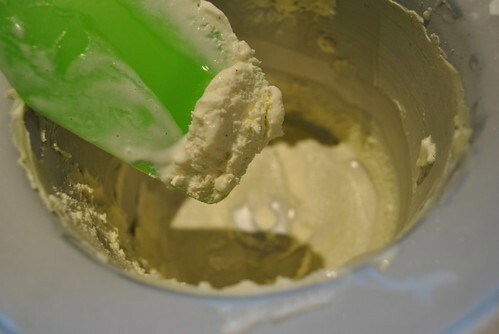 Then pour that tempered egg mix into the hot milk mix, while whisking the milk mix. Then I turned the flame back on, and heat this mix till very hot, but not simmering (185 degF). 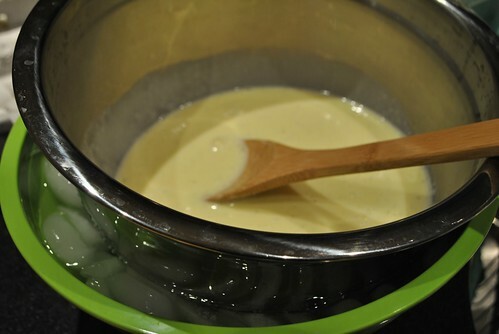 Pour this very hot custard mix through the strainer and into the medium bowl set in the ice bath. Let it cool, stirring occasionally for about 10 minutes. 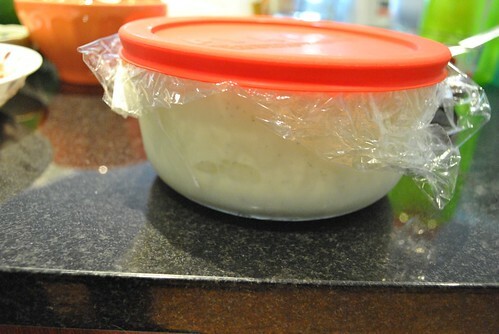 Tightly wrap the bowl in plastic wrap and set in the fridge to fully chill. I left it in the fridge over night. Set up your ice cream maker. 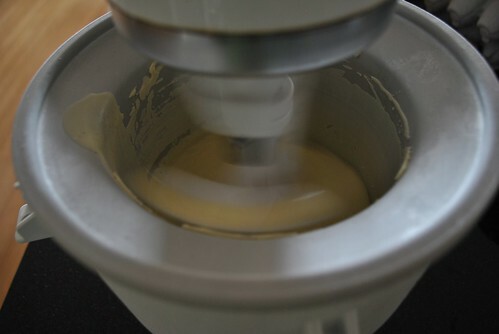 Give the custard a good stir and then pour into the ice cream maker and churn according to the manufacturers directions. If you are using the kitchen aid one, set all the parts up, and then set the thing on stir before pouring in the custard. Churn until it has the consistency of soft serve ice cream. I churned mine until I heard clicking from the machine. Then, the messy part. Transferring it from the ice cream bowl into the container it will be stored in was a bit of a mess. The stuff melts pretty damn fast! So i did my best, and I tried to cram it all into a single container (my pyrex lunch container), but needed a second one. Use a spatula to lick the bowl! After about 4 hours, I scooped some out and topped it with some mashed red bean. It was delicious. 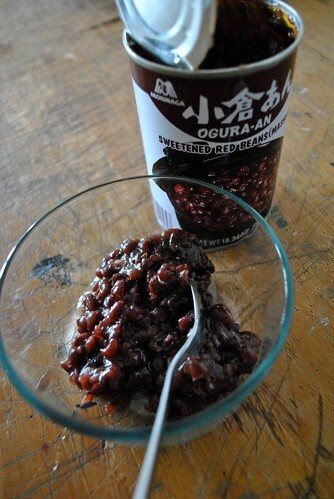 It was creamy and not very sweet, which worked very well with the mashed red bean topping. 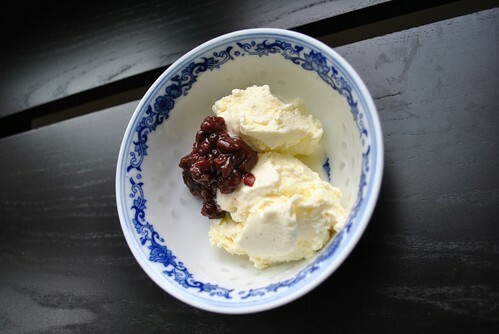 This entry was posted in Dessert, Uncategorized and tagged ice cream, red bean, vanilla. Bookmark the permalink. 1 Response to It’s Ice Cream time!